For tourists or casual hikers who want to see the best of the Zion Narrows, this is the route to do. Starting at the Temple of Sinawava (the last stop on the free Zion Canyon shuttle), you can hike up the Riverside Walk trail and then continue hiking right up the river to see some of the best "narrows" sections of the North Fork of the Virgin River. Hike up as far as you want to go and then turn around and retrace your steps. A side hike up Orderville Canyon is also a good detour to see even more amazing slot canyon scenery. As a round-trip hike, this can be as leisurely or strenuous as you wish to make it. No description of the Narrows would be complete without a stern warning about the danger of flash foods. Many tourists are caulous about taking the weather seriously, but please do not do this hike if the forecast calls for rain. A strong enough rain storm can quickly turn a calm and shallow stream into a deadly wall of rushing water. Please check the weather forecast and the Wilderness Desk for current conditions and for any advisories. Remember that it doesn't have to be raining directly above you for a flash-flood threat to be possible. Time Required: Allow at least 6 hours to reach and enjoy the best sections of the Narrows. Length: 2.5 miles from Temple of Sinawava to Orderville Canyon and Wall Street (one-way); 2 more miles to Big Springs. Elevation Change: gradual ascent up the river. Seasons: Summer and fall. The Narrows are generally closed for much of the spring months due to snowmelt and spring run-off (typically mid-March to late May). Winter hiking is possible with proper protection (wetsuits/drysuits). Permit Required? NO, a wilderness permit is not required for the "bottom up" Narrows hike. Flash Flood Warning: Check weather forecast and do not do this hike if there is a threat of rain. Due to the epic popularity of the Zion Narrows "Bottom Up" hike, it is important that all visitors be aware of "leave no trace" ethics and try to minimize their impact. Since 2010, there has been a growing problem of graffiti and vandalism in the lower sections of the canyon where hoards of tourists visit every day. 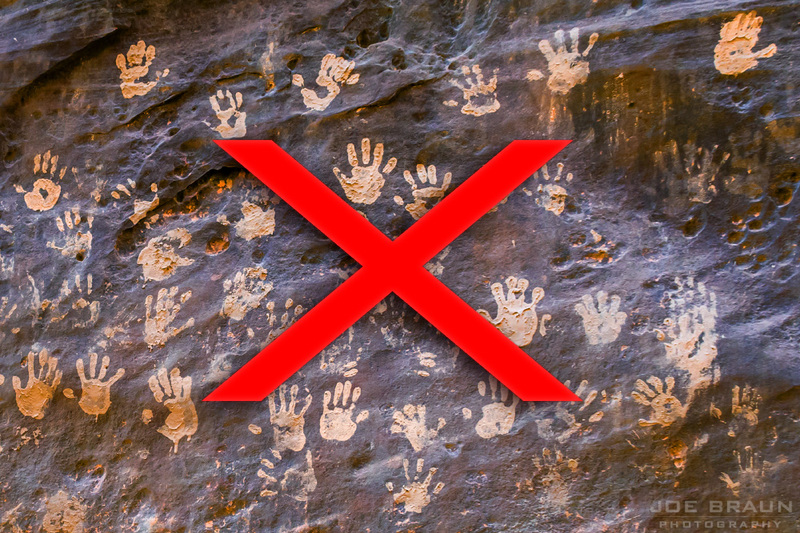 Please do not make mud drawings or handprints on the walls of the canyon. Please do not carve or scratch your name or anything else into the rock formations. Please do not build cairns or other decorative formations out of the stones. While you may think that these actions are harmless, the National Park Service considers these actions to be illegal vandalism. This isn't your bedroom or your local town park; please do not ruin the wilderness experience for others. If you witness anybody else doing this, please tell them to stop and consider taking their photo and reporting them to rangers. 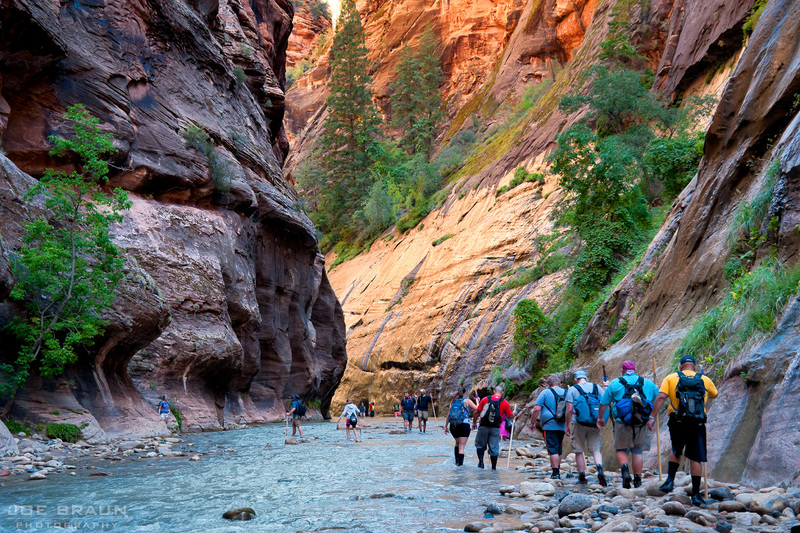 You do not need a wilderness permit to hike the Narrows this way. Starting at the Temple of Sinawava (the last stop for the Zion Canyon shuttle bus system), hike up the pleasant Riverside Walk trail until it ends about a mile north. Now the fun begins -- it's time to start hiking right in the water! Less than half-a-mile from the Temple of Sinawava, you will pass Mystery Falls, a beautiful spot where water rolls down the sandstone walls from the canyon above. Roughly 2 miles from the Temple of Sinawava is the beginning of the section that many Springdale outfitters call "Wall Street" -- the start of the narrowest section of canyon where you will now be hiking in the water almost all of the time. And soon after, you will pass the mouth of Orderville Canyon on the right (east) side of the river. Side Trip up Orderville Canyon: For a diversion from the main Zion Narrows hike, you may want to explore up Orderville Canyon a bit. 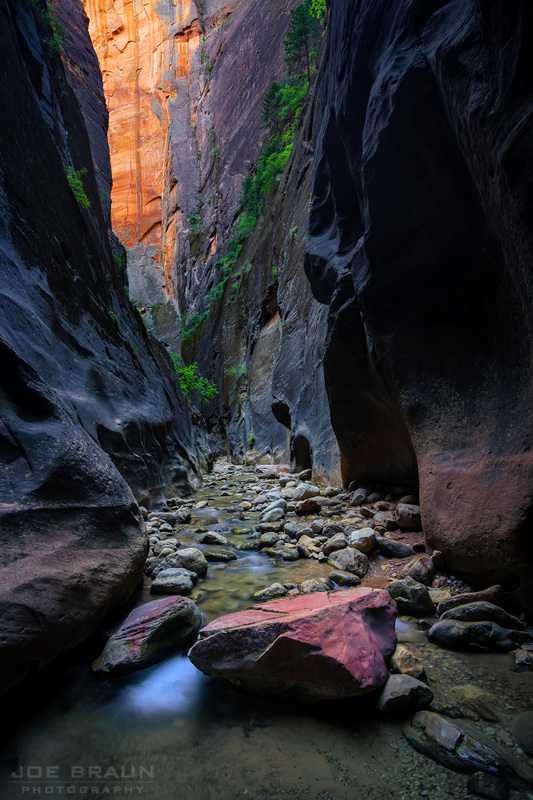 Orderville Canyon is a tributary that is even taller, darker, and more enchanting that the main Narrows. The canyon has much less flowing water, but there are many obstacles that involve a bit of rock-scrambling and a bit of swimming to overcome. Roughly half-a-mile up Orderville Canyon, you will come to a small waterfall formation (known by some as "Veiled Falls") where the National Park Service has placed a sign that prohibits further travel upstream. While it is physically possible to make your way up the falls and explore a bit more, be aware that coming down is a lot more difficult. Subtle moki steps are in the right (south) canyon wall, but many people have jumped the falls only to twist an ankle and require rescue. Use your best judgment and don't press your abilities. Turn around when you have had your fill. Continuing up the Zion Narrows, the canyon remains dark and impressive with no high ground to climb up to in the event of the thunderstorm or flash flood. Most hikers will continue hiking up through this section and then turn around when the scenery mellows out a bit. But if you have the time and the energy, the next section is more difficult as the canyon is littered with large boulders that block parts of the river. You may have to search around a bit to find the easiest way to scramble over and around the obstacles and avoid a few short deeper sections of water. No obstacles are insurmountable, so always look for alternatives. The hiking season for the Zion Narrows is typically summer and autumn, but the start of the season is controlled by the spring runoff and water levels. 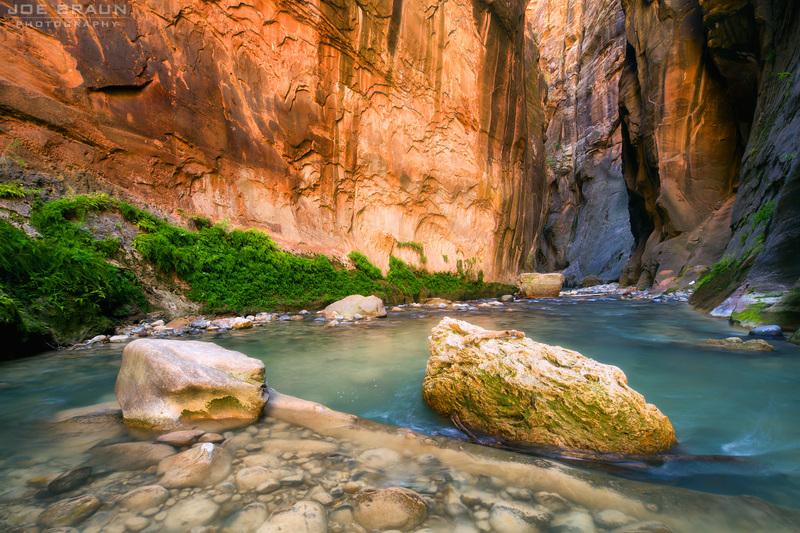 The Zion Narrows is typically closed to hiking between mid-March and late May, depending on how much snow fell on the high country in winter. In record snowfall years like 2005 and 2011, hiking in the Narrows didn't open until mid-July. To see the current and median water levels as well as track the melting of the snowpack in spring, please see the Current Conditions page. Note that it is possible to hike the Narrows in fall and winter, provided you are adequately prepared for the cold water; farmer-john wetsuit bottoms or even drysuits may be called for, depending on the temperatures. If you want to do the top-down Narrows in the winter, keep in mind that the NPS Service will not issue a one-day top-down permit because there is not enough daylight to complete the hike safely. Snowfall or heavy rains may also make the dirt road to Chamberlain's Ranch impassible. 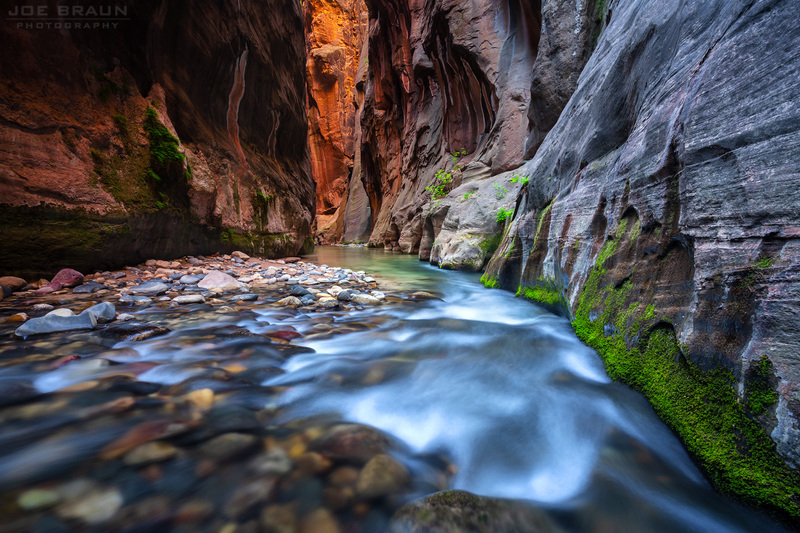 The difficulty of hiking the Zion Narrows is greatly affected by water flow. A flow below 50cfs indicates relatively easy hiking conditions while flow above 100cfs can be difficult and dangerous. The Wilderness Desk will not issue a permit for the Zion Narrows if waterflow is above 120cfs. Also note that hiking is much more difficult when the water is murky (like chocolate milk) several days after flash floods. Not being able to see rocks under the water's surface can really slow you down. Good footwear that covers your toes are must, as are hiking poles (or a hiking stick) and a fleece. Since you will be hiking in water most of the time, you will want to keep all of your electronics and overnight gear in drybags. Please see the Zion Narrows Overview page and the Hiking and Backpacking Gear list for specific recommendations. For the first mile of the hike, there are plenty of pockets of vegetated shoreline. While most hikers will choose to hike from shore to shore rather than staying in the water all of the time, please do your best to avoid trampling the plantlife. If you need to pee, it is actually best to go right in the river rather than on a shore or bank. But if you need to do more, you must pack out your solid waste. This may seem gross, but it's actually quite easy and safe to do. Solid waste bags like the Restop 2 and the Cleanwaste GO Anywhere Toilet Kit Waste Bags contain waste bags and odor neutralizers to help you carry everything out as pleasantly as possible. Ziplock bags and used Mountain House pouches can also get the job done. Practicing the highest level of "leave no trace" ethics in the Narrows keeps the canyon pristine and pleasant for the next people to enjoy! The Zion Narrows day hike is an all-time classic; it's one of the best hikes in Zion and arguably one of the best hikes in any American National Park! With its amazing scenery and the thrill of hiking in water all day, who could ask for more? This hike is strenuous and demanding, but you can turn around whenever you like. But if you want any sense of solitude, start hiking very early in the day; by mid-afternoon, the lower sections of the Narrows hike resemble a flash mob with many, many people sharing the river.